The late Archbishop Frank Simon (dedicating the land where he will be finally laid to rest). The service and burial of the late Archbishop Frank Simon will be held at St. Elizabeth Spiritual Baptist Cathedral on Sunday 14th October 2018. The body will lie in State at the Cathedral from 8:00 AM to 10:30 AM and the funeral service will begin at 11:00 AM. There is a packed program with tributes to honour the life of this noble son Sir Frank Simon. 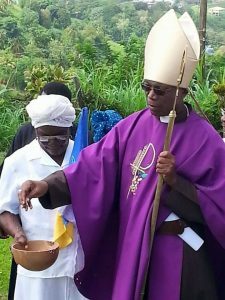 The Spiritual Baptist Archdiocese of St. Vincent and the Grenadines has lost a wealth of knowledge because of this tragedy leaving behind many unfinished tasks. It is my prayer and hopes his successor will try to pick up the pieces and continue carving the way forward for the younger generation. I feel honoured that Archbishop Frank Simon’s final resting place will be at the place he dedicated at the request of the late Patriarch Edmund John. This is a great honour to the man who loves the church and Archdiocese. The Organization he served with pride, joy, love and humility. MAY THE SOUL OF SIR FRANK SIMON REST IN ETERNAL PEACE.